In our latest news we share with you how the GDPR affects your email marketing efforts. If you’re a regular reader of our blog, you will know that we are big advocates of email marketing, and that’s because time and time again e-marketing stats show just how powerful a marketing tool it is. If you’re saying to yourself ‘I thought email marketing was dead?’ It may come as bit of a surprise that almost 50% of marketers say that email brings them the greatest Return On Investment (ROI) above all other marketing channels including social media. Social media has been on the rise over the past few years and we have no doubt in its ability to reach huge numbers of the public. However, due to recent changes in the Facebook and Instagram algorithms and the latest data breaches by Cambridge Analytica, how these platforms perform in the future, is all of a sudden clouded by a very large question mark. E-marketing has stood the test of time, the only question is now, how will the GDPR affect your email marketing efforts? 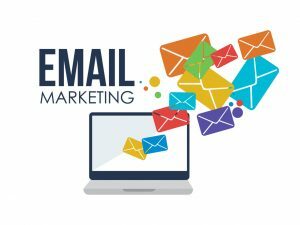 Of course we are here to answer this question for you so you are fully equipped with how to proceed with your email marketing and continue to ensure your audience is happy with the content you send them and most importantly continues to remain a willing receiver. The most important thing you need to know to ensure you comply with the GDPR for your email list is consent. If you have consent to send them the information you want to send using the tick list below, then the changes really won’t have any impact on your email efforts at all. As it states, when you ask for consent it can’t be bundled up with lots of other bits of information you’re asking for consent for, such as a service, terms and conditions, privacy and so on. You have to gain consent for every individual type of data you require. Double opt in is the best way to ensure you have someone’s consent to send information. They fill in their details into a sign up form (usually on your website), your provider then sends them an email with information about what you will send them and asking them to confirm their ‘consent’ or ‘agreement to subscribe’ by clicking a link, once they do so they have ‘double opted in’ to receive information from you. Opt-in forms need to have unticked boxes, the person signing up needs to have complete responsibility for doing so. There can be no ‘trickery’ in the process, everything needs to be above board and entirely under their control. Your content needs to be in plain English and easy to understand. Give it to them straight about what you need their data for and what you plan to do with it. Be upfront and honest with every bit of data you need from them and the reasons why you need it. Where possible, if you need consent for multiple areas of data collection you must use separate check boxes or opt ins and not try to house everything under one. There can be no surprise with the information you store or send, all parts require consent. Customers (or your audience) must be fully confident who they are giving their data to and therefore you must name not only your company but the names of any third parties who may have access to that data. Any third parties must also comply in every way with the GDPR. There can be no surprises landing in their inbox from you or anyone you’re associated with! Just as easily as they opted in, your clients, customers or audience need to find it just as easy to ‘opt-out’. You need to spell out (when they sign up) how they would go about unsubscribing, asking to be ‘forgotten’ (right to erasure) or cancelling. They have the right to do so and you have the legal obligation to carry out their wishes within one month (**). **Different terms may apply if you are a legal business, work with vulnerable people or a government organisation so it’s wise to ensure your relevant teams are aware of these specifics. **If you can justify either, then you can refuse a request or even charge a reasonable admin fee to process that request but you must be able to back this decision up! Organisation is key in any business and that is even more important when it comes to the GDPR. You have to record when and how someone consented to receive information from you, who they are and what they were told. The first thing you need to look into is your existing client base and how you obtained their details. If you already offered the double opt in then there’s not too much work for you to do, but if you didn’t then you will need to go back to them all way before the 25th of this month (May) and ask for their permission to continue contacting them and storing their data for the purposes you need to. If you need further support with GDPR compliance we can highly recommend the services of GDPR365 who can make the whole compliance process a lot simpler for you. If you’re already a user of our CRM system then you’re naturally covered by our own compliance because, as you would expect we’ve been planning for these changes for quite some time. Don’t forget to ensure your website has pages or areas easily accessible by your visitors that explains to them in plain English what they can expect from your website and any further steps they take to share their data with you or any third parties you’re affiliated with. If we can be of any further help in explaining how the GDPR affects email marketing or any other aspects of your digital marketing then please don’t hesitate to get in touch.